Purchase Kevin Daniel Art Prints online from ArtBarbarians.com located in Minnesota. It can be hard for an artist to capture a moment in still life, but there are a few who do, and do it well. Sometimes a print simply displays a moment in time, but to get the feeling of the occasion is something else all together. Kevin Daniel art are probably some of the best examples of this ability to understand the moment. 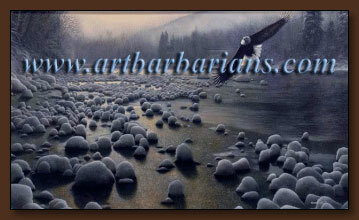 Like most people you probably can identify with nature like most of the artists we feature here on our web site. We have a couple of examples of this artist's work. You get a sense of activity and beautiful color in his art that is deep and rich. Kevin Daniel began dabbling in paints and completing portraits as a young man in the late 1960's. In his twenties, he began concentrating on painting animals and wildlife, discovering that people really appreciated the realism and natural beauty he brought to his subjects. Daniel continues to attract a growing body of collectors. 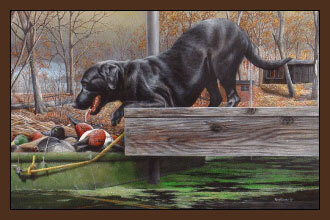 His images have also received many honors including 1991 Minnesota Wildlife Heritage Foundation Artist of the Year. Another great Kevin Daniel art original is the picture below which is titled "On Eagles Wings". This image gives the feeling of the open sky and how it relates to the land. It looks so much like lowland areas and you can almost smell the fresh, cold water and the land. You can see the snow gathering on rocks and see ice forming on the surface of the water. It's a hard to create such a subtle variation of light that gives a unique aspect to this fine original. You can see from both pictures that this artist has a flexible sense of colors and enjoys creating scenes that reflect true nature and the personality of the animal subject. Call us if you have any questions about anything you see on our web site or need to know more about Kevin Daniel art prints. We're happy to answer your questions personally regarding availability or something special you're looking for.